Piècea001629 - B.C. Vocational School image of an Automotive program instructor teaching and students observing a procedure in the shop. Piècea001630 - B.C. Vocational School image of an Automotive program instructor and students working on a vehicle in the shop. Piècea001631 - B.C. Vocational School image of an Automotive program instructor and students working on a vehicle in the shop. Piècea001632 - B.C. Vocational School image of an Automotive program instructor and student working on a vehicle in the shop. Piècea001633 - BCIT Student Association - copy of the Link crumpled on floor of the Student Association Centre. Piècea001635 - Colt 45 bottle of beer with a bouquet of flowers: "To the Link Editor"
Pièce a001633 - BCIT Student Association - copy of the Link crumpled on floor of the Student Association Centre. 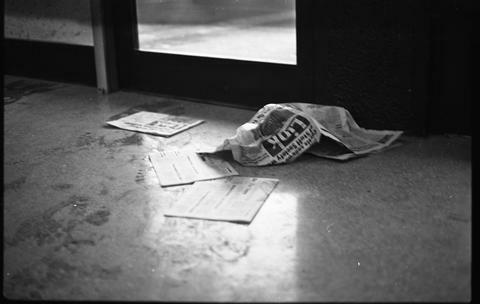 Anglais » BCIT Student Association - copy of the Link crumpled on floor of the Student Association Centre.